Looking for a USED FVM-104125DC? The double column vertical machining center from Chevalier is suitable for your large workpieces. The machine is designed with a heavily ribbed cast-iron base of Meehanite casting to ensure best rigidity and stability of the machine. The exclusive design of the spindle center position is close to the bridge center, which results in consistent accuracy and smooth movement, especially for cutting rigidity. 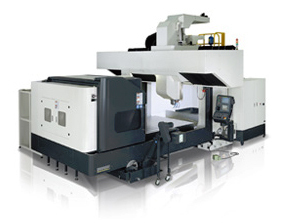 The double column vertical machining center features its big size column and extra-wide spacing of box ways on a slanted Y-axis and close symmetrical design of the Z-axis. All models feature 30 HP spindle motors with two-speed gearbox. Looking to Purchase a New CHEVALIER FVM-104125DC?